White Rock is one of the most visited tourist destinations in British Columbia. There are countless shops and restaurants along the main strip and that means competition! Don’t let a vandalized storefront bring your business down. 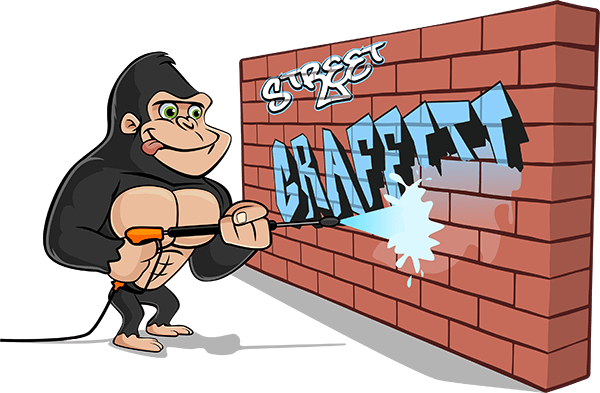 Call our Gorillas for our White Rock graffiti removal services. Residents and business owners in the White Rock area take great pride in their space. As much as you might try to keep your space clean and welcoming, it is impossible to predict the actions of others. It has never been easier to be a graffiti artist! Aerosol paint is easy to come across, simple to transport and quick to use. You can go to bed with a completely clean property and wake up to a Jackson Pollock across your windows, walls and doors. Taggers move silently, working with precision – but so do our Gorillas! Our White Rock graffiti removal can help return your property to its former glory. If you are toying with the idea of tackling your White Rock graffiti removal yourself, there are a few things to keep in mind. Everyday cleaning solutions can allow paint to drip and bleed, spreading the stain to an even larger area. Pressure washing alone can also drive paint further into the substrate of your property’s surface, leaving behind a ‘shadow’ effect. Instead of risking a larger problems, call in the pros! Removing graffiti from your property is not the final step to our White Rock graffiti removal service. In addition to proper removal techniques, our services include proper preventative measures as well. Our “Gorilla Anti-Graffiti Coating” dries on clear and allows for easy, chemical-free graffiti removal the next time around. Gorilla technicians don’t just react in the moment, we plan for the future!